Are you struggling through out-of-control circumstances? Where do you turn when discouragement strikes? How can you learn to process feelings of despair? 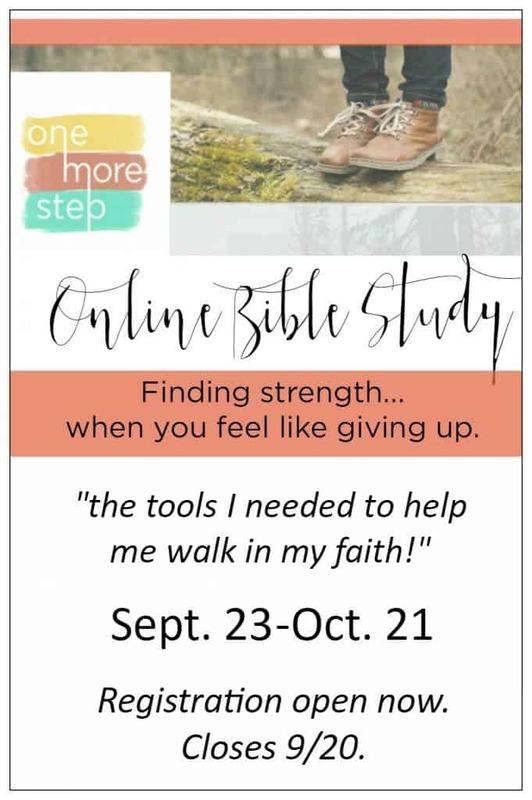 If you’d love the answer to any of these questions, then this online Bible study, One More Step: Finding Strength When You Feel Like Giving Up, is for you! This book is my “heart book”–the one I wish I could sit down with you over coffee and share each word. 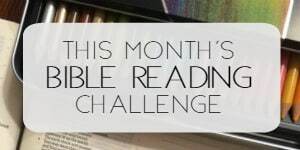 We may not be able to have coffee together, but we ARE going to read through the book, pour over the Scripture in each chapter, and work through the stepping stones. We’re even going to host social media chats where we discuss the answers to these questions!! The first small leaves are beginning to fall at my house and I can hardly believe the summer has passed by. But here we are and I am so excited to walk through the One More Step Fall Online Bible Study with you!! When we finished up the 4 week spring study, many of you requested another hike through this material. And I’m with you all the way! So here’s the scoop on how it will unfold. Ready? Thursdays – Beginning 9/29/16, Online Social Media Discussions will be held weekly on my Facebook page. 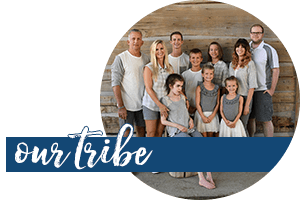 Each Day- you will receive an email with reading and study reminders/suggestions, including Scriptures, inspiring quotes, and thought-provoking questions. The book– It’s most helpful to own a copy of the book, either paper or digital, in order to complete this study adequately. You will not need to purchase anything else to participate. You can order or purchase the book, One More Step, Finding Strength When You Feel Like Giving Up, almost anywhere books are sold; this link will help you find the book at your favorite retailer. The online study is designed to watch the video for the week, then read 4 chapters of the book. Optional helpful tools: The FREE Stepping Stones companion guide is available for download here. 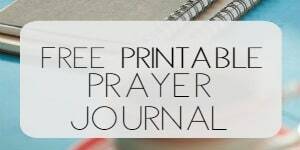 You will want to have a Bible or Bible app, pen or highlighter. You will get out of this study what you put into it! You can do it! A new browser window will open when you click on the above words “Sign Up Here” or click here to sign up. REMEMBER: Registration closes 9/20/16. So don’t delay! Tell your friend, neighbor, co-worker, sister, or parent and join us for this wonderful Bible study on turning to God’s Word when discouragement strikes. I don’t have Facebook and do not want Facebook account. I don’t know if that will change my participation ability. This is my third email to you and I don’t really expect a response, seeing as how you haven’t responded to the at least other two emails. I have purchased and read your book. Well done. Hi Catherine! Participating via Facebook is totally optional and up to the user; no problem at all. I don’t have an assistant and I always ask folks to give me two weeks to respond to emails because I receive so many and try to respond to as many as I possibly can personally. However, I don’t see an email from you; this is the first message I’ve read from you at this point. My sincere apologies. I did not receive the emails for the study last week, but had registered well within the required timeframe several weeks ago. I have already purchased my digital copy of the book. Please advise – thanks! Susan, I am so sorry that I am just now seeing this. I have emailed you. Thanks.